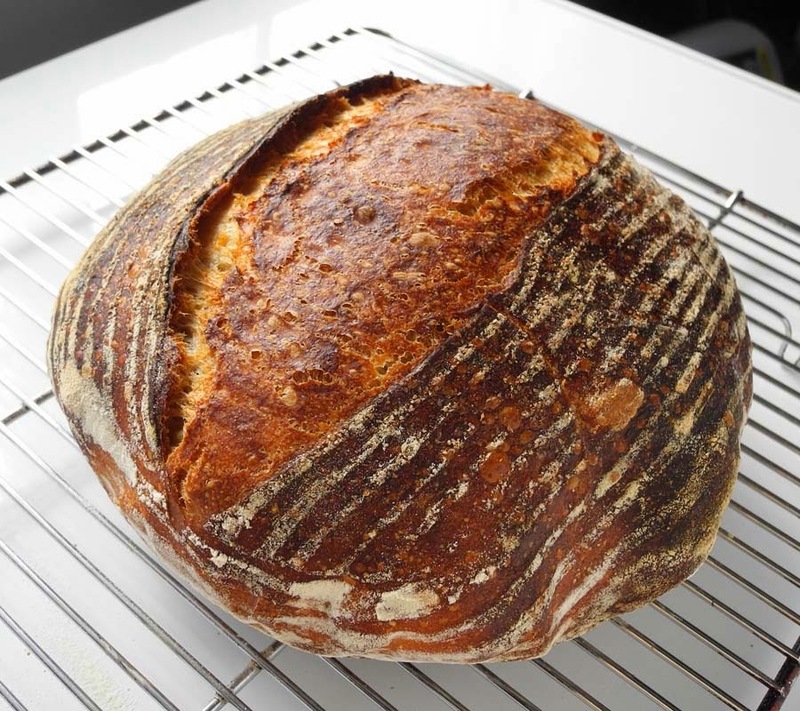 After being very satisfied with several loaves of Ken Forkish's Field Blend #2 with some variations, I decided to try another Forkish signature recipe from Flour Water Salt Yeast - Overnight Country Brown. 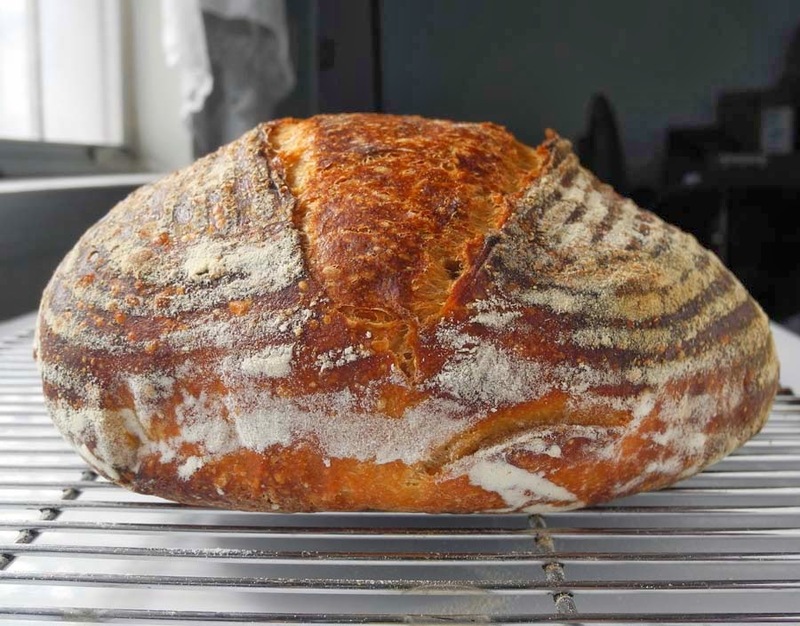 In his book, there is another version called Overnight Country Blonde (with 90% white flour, 5% whole wheat flour and 5% rye flour), which is the most popular bread at Ken’s Artisan Bakery, Forkish's own bakery in Portland. 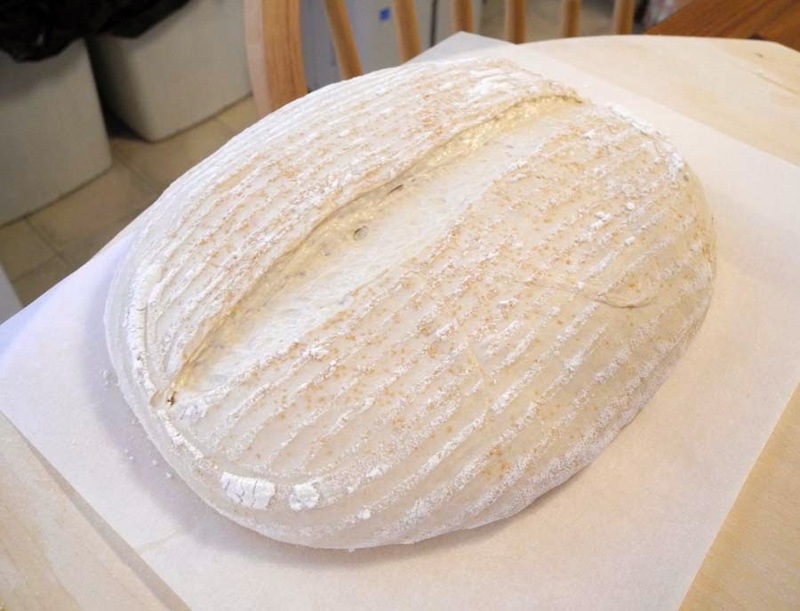 (My friend in Portland visited the bakery and tried a loaf recently, and said it was amazing.) 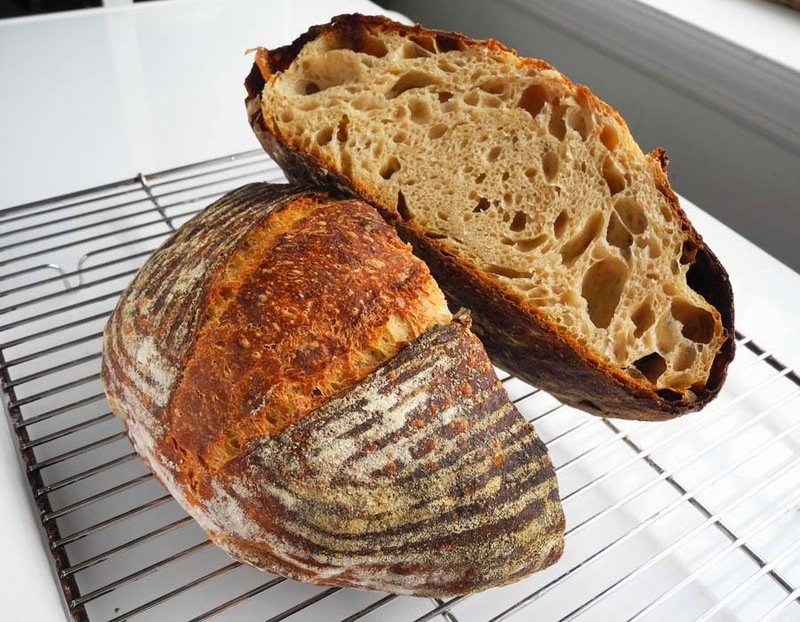 The Overnight Country Brown contains 70% white flour and 30% whole wheat flour, which is a ratio of flours I really like. 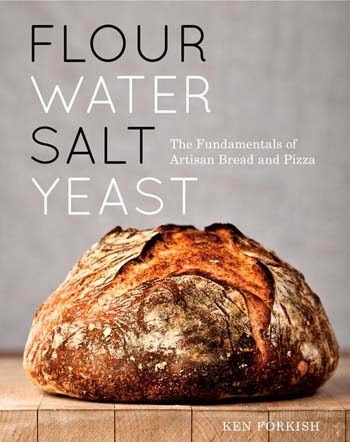 This recipe calls for a long overnight bulk fermentation process (12-15 hours at room temperature) with a smaller amount of levain than other recipes in this book. The natural sweetness and complex rich flavors of the flours are supposed to be fully extracted via the long slow bulk fermentation. 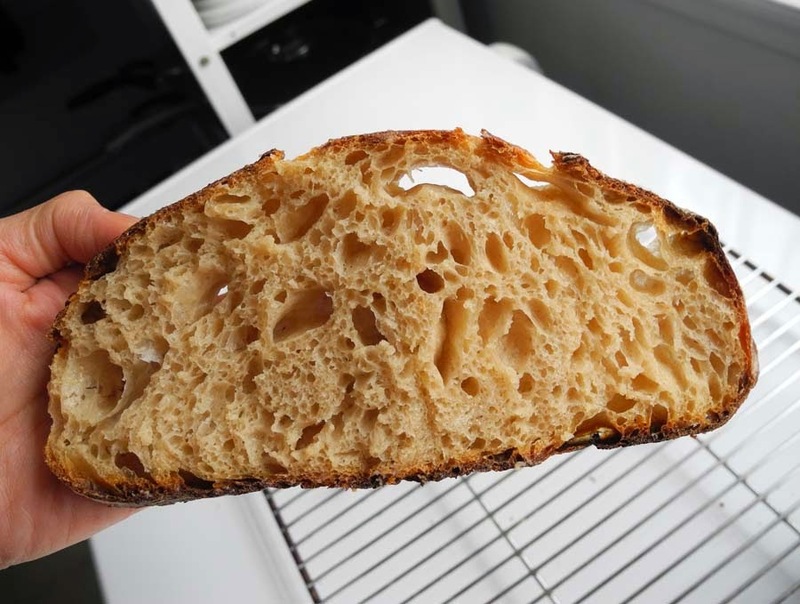 It sounded fantastic - I was curious about how this long overnight fermentation method would affect the resulting taste of the loaf. My levain was mixed 7 hours before the final mix, as the recipe suggested. I normally use a few hours younger levain than that, which barely passes the float test, but I decided to follow Forkish’s instruction this time to see how the more matured levain affected the bread. 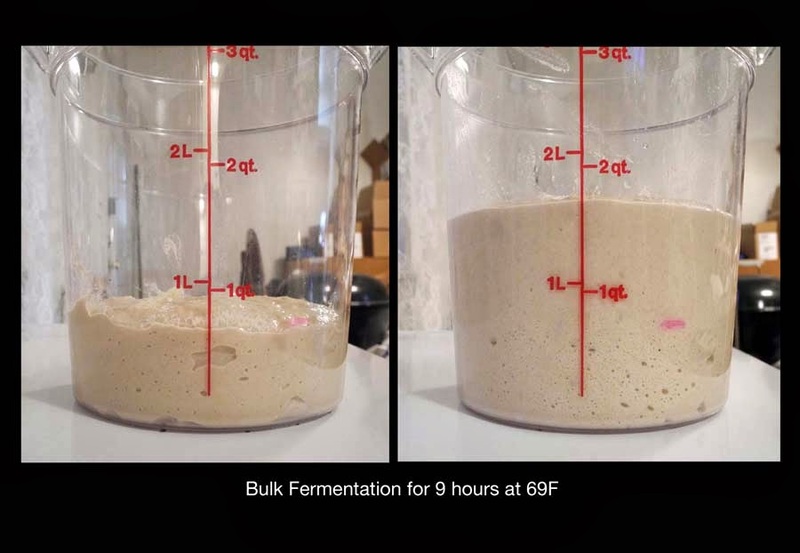 During the bulk fermentation, the dough was supposed to rise to 2-3 times its size after 12-15 hours. Perhaps because the initial dough temperature was a little too high (81F), the dough rose faster than I expected, more than double in 9 hours. After long overnight bulk fermentation at room temperature (71F), the dough looked very gassy and vigorous, which was a good sign. A unique part of Forkish's method is to omit bench rest before final shaping. I had never omitted bench rest in my baking, but this time I decided to follow his way to see how the resulting loaf would be different without bench rest. Final rise went faster than expected, perhaps since the dough was more active at this stage. I proofed the loaf at room temperature for 1.5 hours, then proofed it in the refrigerator for another 20 minutes to slow down the fermentation. The proofed loaf was very bubbly. Oven spring was pretty good. I was slightly worrying that the directly shaped dough without bench rest might not have gained enough strength and tension for good oven spring, but it turned out OK. I baked the loaf in a preheated oven with combo cooker at 475F for 30 minutes with the lid, and 20 minutes without the lid. One issue was that my oven tends to go up 50 degrees higher than the set temperature, so accidentally I baked the loaf at 525F for the first 10 minutes or so, which caused some burnt spots near the bottom. I need to remember in the future to set the oven temperature lower than it is supposed to be. Although the final loaf had some burnt spots, I was very happy with the thin crisp crust and the deep amber color of the bread. 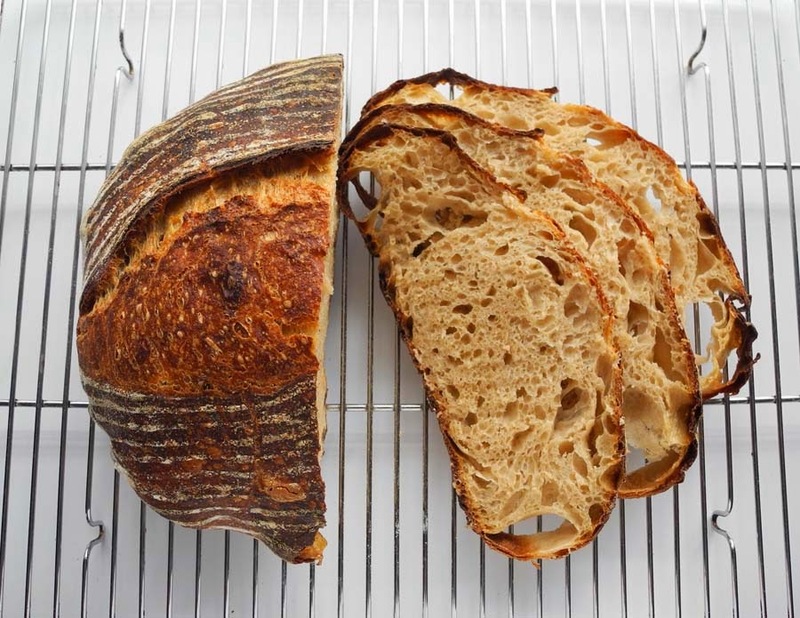 Forkish's way of shaping the loaf without bench rest seemed to give the crumb larger, more relaxed-looking irregular holes than the loaf with bench rest. I like the wild look of the open crumb. 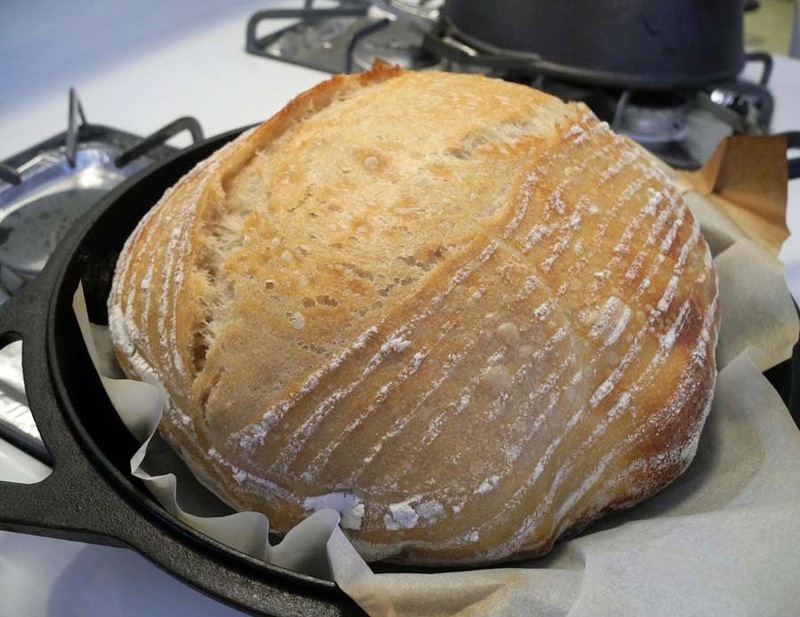 The characteristic of this bread was the tanginess from acidity that was quite recognizable right after being baked, but the tanginess mellowed as the loaf matured. I was surprised at the obvious transition of the taste and flavor of the bread. 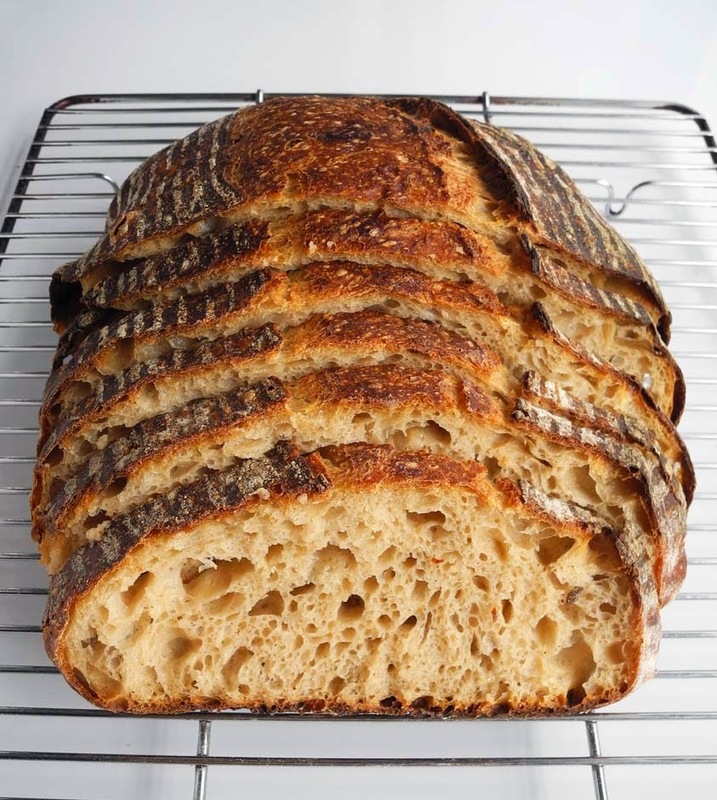 The initial tanginess faded out over the next couple of days, and melded into a wonderful, deep sweetish umami flavor - almost like some magic turned it into different bread. The crumb was very tender and moist, a great contrast with the crisp thin crust. (Actually, the burnt spots tasted amazing.) The gluten seemed to have fully developed via the long overnight bulk fermentation. 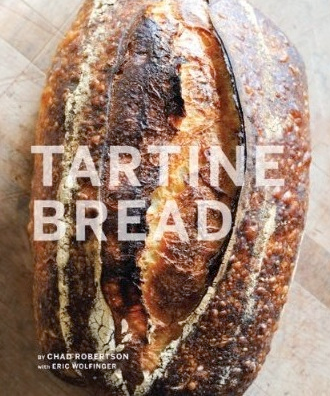 Forkish wrote in his book that the aroma and flavor of this bread would directly reflect the character of levain. 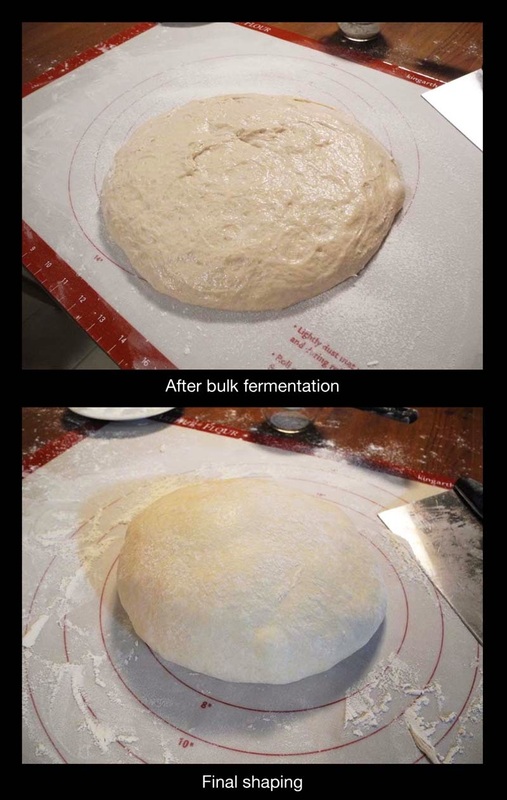 Next time, I will try to use even younger levain to see how it would affect the resulting taste. 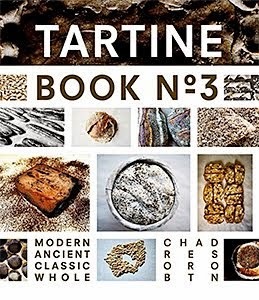 Very nice, Ive been baking from his book for a couple of years now, still can't get the pure levain recipes down ' seems my levain is twice as fast as his maturing . Thanks for your comment. My levain matures much faster Forkish's, too. I guess it depends on the area you live. I think the Forkish recipes are based on rather cold area in the US, so we need to adjust the temperature and duration for proofing time. Trying this tonight - not quite the same timelines - working around my day-job. Otherwise I hope to get something like yours. Thanks for your comment. 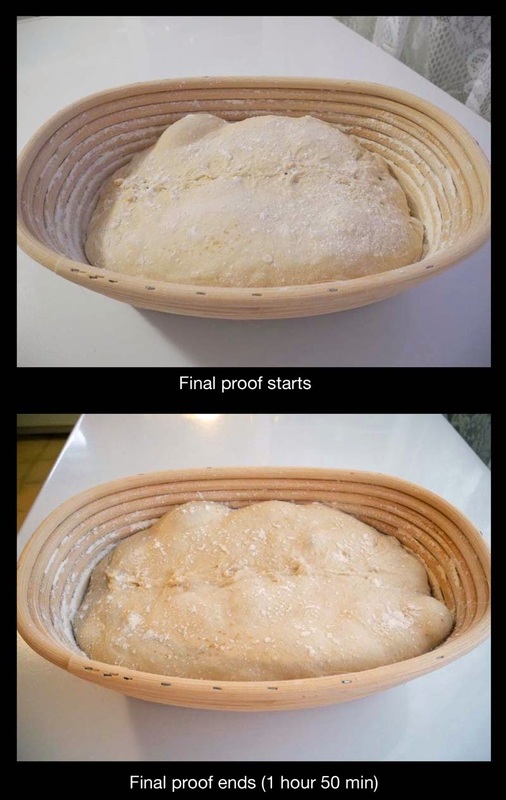 Hope you will get a good result in your bread baking!